The large 23.6" Asus Splendid LCD monitor is a full HD 1080p widescreen display that provides true-to-life and stunning clarity multimedia experience with a 20000:1 (ASCR) contrast ratio and HDMI input, along with built-in hidden stereo speakers and SPDIF audio output. The Asus exclusive Splendid Video Intelligence technology optimizes overall display for the best results in image preview, movie playback and gaming, with five preset modes (Standard, Game, Scenery, Night View and Theater) and 3 skin tone presets for more natural-looking human subjects on screen. You will enjoy optimized colors for various multimedia entertainment scenarios on the VH242H. Coming in contemporary glossy piano-black front bezel and smooth base, the stylish VH242H is also designed with sophistication, like convenient key controls, cable management, and VESA wall-mountable. Whether you're rendering video or graphics, enjoying your photos and movies, or gaming, you won't believe your eyes when you see the stunning color and clarity of the Asus VH242H. 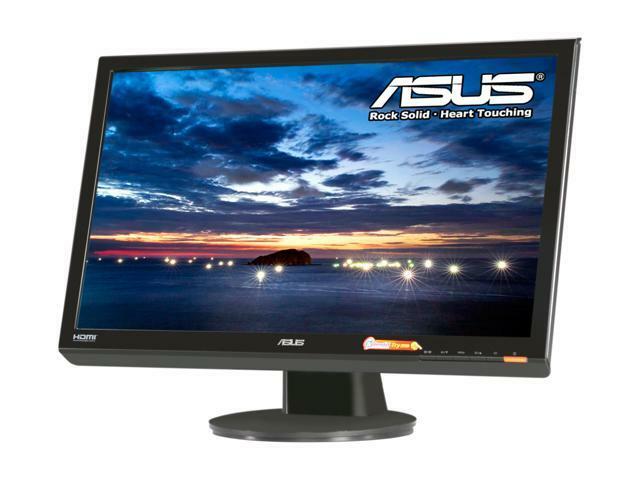 Full HD 1080p Support With a maximum 1920x1080 resolution and widescreen (16:9) aspect ratio, the Asus VH242H displays full HD 1080p content in its native format without any loss of image quality. ASUS Splendid Video Intelligence Technology The Asus exclusive Splendid Video Intelligence Technology employs a color engine to automatically optimize image quality with intelligent color, brightness, contrast and sharpness corrections for the best results in image preview, movie playback and gaming. 5 Splendid video preset modes via hotkey as well as 3 skin tone presets are available for optimal visual experience. ASCR (ASUS Smart Contrast Ratio) Technology ASCR Technology automatically adjusts the luminance of the backlight for better displays according to the image contents, and improves the contrast ratio to 20000:1 for more realistic depictions of night scenes during games or movies. Aspect Control Aspect Control function allows users to select a preferred display mode among Full and 4:3 for true-to-life gaming or movie watching without any data loss or image distortion. HDCP-Enabled HDMI/DVI Input The Asus VH242H features an HDMI input to receive high-definition digital video and audio through a single, convenient cable connection. HDMI's appeal has made it the choice interface for a broad selection of HD-capable video devices and gaming consoles. With HDCP (High-bandwidth Digital Content Protection) support, unlock high resolution and superb-quality protected content. ASUS RAPID REPLACEMENT 2 WAY FREE SHIPPING ASUS now covers return shipping as well as shipping back to the end user, and offers free cross-shipping advanced swap for all urgent LCD RMAs requiring further expedition. Now you can get a replacement LCD as you send your RMA, because good customer service just makes sense. See here for details: //service.asus.com/ARR.html. 22.13" x 16.38" x 8.66"
Pros: Bought in 2009, gave it to my friend a few years ago and its still running strong! Pros: -True 1080 resolution at a high gaming speed. -Beautiful screen colors like a Samsung Galaxy Note. Pros: I've had this monitor since 2012. It's a wonderful monitor, the colors out of the box have been the settings I have used. I game most of the time, and the first time I used this monitor it was like night and day difference between a TV. -Only 1 dead pixel in 5 years. I don't even notice it, someone else might, but to me it's just a constant black dot. Like a tiny speck of dirt that can never be removed. It doesn't bother me one bit and I'm very happy to only have 1 in 5 years. Dead pixels were expected, but not found. -I've taken this to friends houses, I've taken it on multiple trips back and forth to college and my house. (I only wrapped it in a thick blanket) It's held up, I've never had any power issues or anything strange going on like flickering screens. Every setting has always worked. -I'm sure most monitors nowadays have this but the dimming option was really nice for when I had people sleeping in the same room. -The speakers are exactly what you would expect. There's a lack of bass, but if you just want to hear sound it will do what you need. If you want quality sound, you're gonna want a separate set of speakers. Other Thoughts: If you can find this monitor somehow, or a monitor of the same model just upgraded, buy it. It's served me well for 5 years and I'll continue to use it until either it, or the world ends. Pros: I bought this as my first 1080p monitor probably 5 years ago. It was open box so when I received it was no surprise that it was DOA. The newegg policy at the time had me RMA through ASUS which I did. Asus paid shipping both ways and although it took an extra two weeks to have it up and working, the monitor has been running perfect since. Built like a tank, has survived many moves and other less than good treatment and is still running just fine. Cons: they no longer make it! Other Thoughts: I still use this to this day! Although I must admit that I am starting to look into the 4K monitors but I will still keep this as a dual monitor set up, or maybe even triple. Pros: Excellent colour reproduction, sharp distinct detail and smooth rich gradients. Even in very small pixel by pixel detailing. I've been using this as my daily for about 4 years on my work(battle)station, most of that time with the brightness cranked. It's taken all of it from (seemingly) hours on end without moving images in UI design and Photo manip workflows with all their lovely dark, or bright grey window frames to hours of fast paced FPS and racers. Not a hint of image burn anywhere on the display, just as bright sharp and responsive as I remember it ever being. Had asked a friend to pick another up a year or two ago as he was making a trip to the shop on his way home and he ended up grabbing a Benq because it was slightly cheaper and a newer model.. Well. the colour has never been even close to a full and vibrant and no matter what I do software or hardware settings I CANNOT make that thing comfortably sharp at anything less than the ideal viewing angle. Whereas my Asus is currently on a vesa arm so i can flip it around to nearly any angle for comfort, matching up with y tablet angle, or 3 way eyefinity sessions. And its ALWAYS clear and sharp. Cons: Sadly, the built in speakers are very tinny, and don't go very loud, unlike the stereo its plugged into with that handy SPDIF for nice smooth sound. But if you actually plan on using the built in speakers, this is something to keep in mind. Now, it hasn't all been smooth sailing, there've been the odd accident of someone falling into the desk and knocking it, or my attempting to climb to the higher shelf and kneeing it over, but aside from a few nervous moments and some frame scuffs its okay. the buttons however. Are not. and they've only ever broke while trying to use them :/ thankfully their easy enough to pull back into place.